Morning Briefing: Choo, Arroyo to Mets? FIRST PITCH: The Mets have all but knocked the Cincinnati Reds into the wild-card game. The Amazin’s also may have helped ensure the Pittsburgh Pirates host their first postseason game since 1992. Rookie Michael Wacha came within one out of a no-hitter as the St. Louis Cardinals beat the Washington Nationals, 2-0, Tuesday night. Meanwhile, the Pirates beat the Chicago Cubs, 8-2. If the Pirates and Reds end up tied, the better head-to-head record would host the wild-card game. The season series is tied, 8-8, entering the final weekend -- when those teams play head to head in Cincy for three games. The Mets, meanwhile, have won four of five on their final road trip entering today’s 12:35 p.m. series finale. If the season ended right now, the Mets (72-85) would pick 10th in the draft, but that is tenuous. The Amazin’s have the same record as the San Francisco Giants, Philadelphia Phillies and Toronto Blue Jays. Ties are resolved by going back to 2012 winning percentage, with the poorer record picking first. So the order would be No. 9 Toronto (.451 winning percentage in 2012), No. 10 Mets (.457), No. 11 Philadelphia (.500) and No. 12 San Francisco (.580). That is not entirely accurate, either, though. Because the Jays failed to sign the No. 10 overall pick a year ago, they get an extra pick at No. 11 pick this year. So the actual order right now is No. 9 Toronto, No. 10 Mets, No. 11 Toronto, No. 12 Philadelphia, No. 13 San Francisco. The top 10 picks in the draft are protected -- even if the team signs a premium free agent who has received a qualifying offer from his former club. Daisuke Matsuzaka (2-3, 5.52), in what should be his final Mets start, now opposes Mat Latos (14-6, 3.23) this afternoon. The Reds moved up Latos a day so he can line up to pitch in Tuesday’s wild-card game on an extra day of rest. Latos just told the Cincinnati Enquirer he has been pitching with an abdominal strain for three months. The Mets are 40-40 on the road entering their final game away from Citi Field. • Daniel Murphy produced a three-run homer in a four-run second inning against Mike Leake and the Mets beat the Reds, 4-2, Tuesday at Great American Ball Park. Jonathon Niese allowed two runs in seven innings to even his record at 8-8. Terry Collins indicated it remained undetermined whether Niese would start Sunday’s season finale against the Milwaukee Brewers or call it a season, but the southpaw indicated he wanted to make that start. Vic Black, who may be the primary setup man to Bobby Parnell next season, or the closer if Parnell has a slow recovery from herniated disk surgery, earned his first major league save. Collins described himself on Tuesday as “worried” about Parnell. Juan Lagares recorded his 13th outfield assist, passing Tsuyoshi Shinjo’s 2001 total for the franchise rookie record. Read recaps in the Post, Daily News, Times, Star-Ledger, Record, Newsday and MLB.com. Bronson Arroyo is a free agent this offseason. • Shin-Soo Choo says he is not thinking about his upcoming free agency. 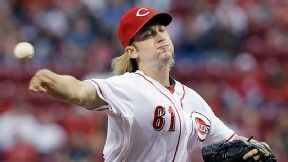 • Mike Puma in the Post suggests the Mets will pursue right-hander Bronson Arroyo this offseason in free agency. “There’s going to be some ballclubs, maybe like the Mets, that have that nice mix of young arms, but need somebody to kind of anchor a rotation with 200 innings, so it’s going to be a very interesting offseason for me,” Arroyo told Puma. Sandy Alderson has given conflicting statements on how aggressively he will pursue a pricy starting pitcher. • Jordany Valdespin has completed his 50-game suspension related to Biogenesis. The Mets shifted Josh Edgin (rib) to the 60-day DL to return Valdespin to the 40-man roster. It would appear unlikely Valdespin is with the organization at the start of the season, but the Mets have the 40-man roster room to retain him for now. The Mets will need to shift Ruben Tejada to the 60-day DL on Thursday, when Double-A outfielder Cesar Puello has completed his suspension. • Jeurys Familia will pitch in the Arizona Fall League. • From the bloggers … Rising Apple debates the merits of an extension for Collins. BIRTHDAYS: Reliever David Weathers turns 44. … Infielder Argenis Reyes is 31. YOU’RE UP: Would you like to see Bronson Arroyo as a Met?